Gather ’round, boys and girls, as Lee and Linz regale you with TMNT tales from their childhoods. Hallowe’en has always been a magical time for me, but I feel like the Hallowe’ens I experienced growing up were more magical than for kids in other areas. For example, there was a house just a few blocks from me that had a huge animatronics set-up in their front lawn. Life-sized figures, a Dracula that would jump out of its coffin, frightening witches, and oh yeah– E.T.! It was magnificent. It hasn’t been around in a couple decades and has produced a few lesser imitators, but I’ll always remember how awesome that house was. Another experience I remember and wish I had photos of: the Teenage Mutant Ninja Turtles van that used to drive around my neighborhood on Hallowe’en night. To set the scene: my mother would dress me up in some kind of ridiculous costume with eyeliner whiskers, precariously perched atop my heavy winter coat because, you know… Canada. From there, we’d go house-to-house in the neighborhood, and then something happened that made all the kids stop: it was the Ninja Turtle van. This thing was big and bright and looked exactly like it was from the cartoon, except less animated. I don’t remember it ever stopping and I don’t remember any Turtles driving the thing, but there it was, zooming past the kids as we looked on in awe. Maybe the driver was legally prohibited from stopping and offering us rides or candy. 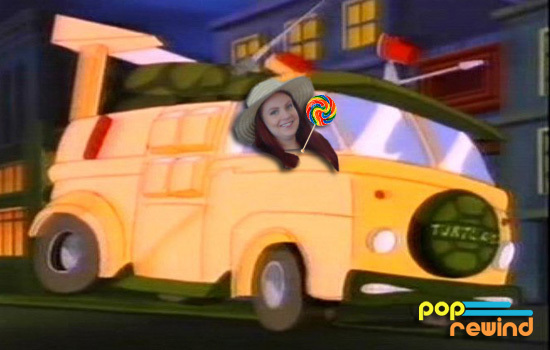 Van + Candy = Win? I always looked forward to seeing the TMNT van every Hallowe’en and I never saw the TMNT van any other night. It was my Great Pumpkin. And maybe it was also a murder van the rest of the year. Unlike Linz, my TMNT tale doesn’t involve vans, candy, or even other people. I was in a position in which I had to be my own entertainment pretty often. 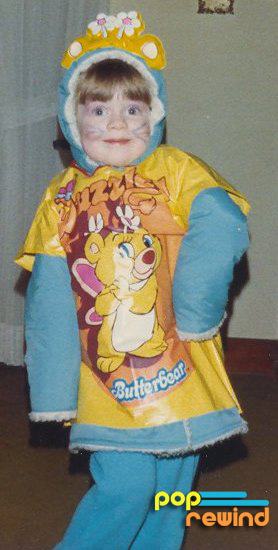 I was also obsessed, like every other elementary school kid in the early 1990s, with the Teenage Mutant Ninja Turtles. The first film was basically my introduction to the half-shelled heroes, but I was in full-force fandom by the time the sequel hit the big screen. When it came out on home video, I had to have a copy. I had been staring at my Secret of the Ooze promo poster from Burger King for months. It was sticky-tacked to the wall right above my bed, so I would gaze into it endlessly. One day, this led to some kind of strange trance. I blared the soundtrack on my Fisher Price Tape Recorder, rewinding Vanilla Ice’s “Ninja Rap” until the tape practically oxidized. 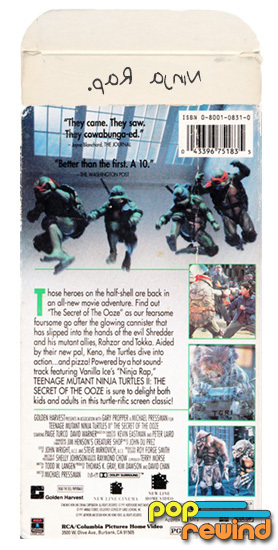 At some point during my ninja moves around the house, I grabbed my copy of the VHS box and a pencil. I opened up the top tab and wrote the following letters backward: paR ajniN. Standing in front of the bathroom mirror, I could unlock the secrets of the hidden message I had left for myself. Diagnosis? Always a weird kid. Like most videos, my copy ended up at a thrift store somewhere. Perhaps, someone else was able to decode the mystery, but I’ll never really know for sure. I can’t help but wonder how my life would have been different if I had simply owned the movie on laserdisc instead – a format that didn’t have paper flaps. Years later, rock group They Might Be Giants released a music video collection titled Direct From Brooklyn. I lifted the top flaps of the video cassette box and, much to my surprise, they had printed “They Might Be Big Big, Fake Fake Lies” (a reference to one of their songs) as a secret message on the video box. I knew I wasn’t the only one! Beyond my love for the TMNT toys & merchandise, it’s stories like these that are my absolute favorite. I can vividly remember those childhood curiosities that heightened the fun and awe of TMNT. For me, it was the guy in the Raphael costume who came and danced at my 6th birthday party. A few friends were convinced it was a REAL Ninja Turtle (a la Santa Claus, Easter Bunny, etc). Man, if a Turtle van drove by, they would’ve went nuts! Also, the phrase “a format that didn’t have paper flaps” makes me giggle. TheSewerDen Is that the dancing moment in your user icon? Someone captured a classic moment in that photo. I got to meet Batman at a 1990 birthday party, but never a Ninja Turtle. 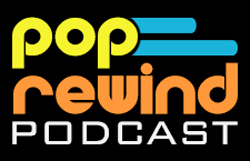 PopRewind Yup! That icon is the magical moment. Meeting Batman is pretty darn sweet. We’re lucky ducks considering we got to me superheroes at birthday parties!